June was a hot and dry month across Arizona with little in the way of precipitation and lots in the way of wind and extreme fire weather. This isn’t all that unusual for June in Arizona, but temperatures were exceptionally warm and passing weather systems brought unwelcome wind which periodically enhanced fire danger to extreme levels. The weather pattern throughout the month was a battle between the strengthening sub-tropical high to our south and late season spring storm pushing through the Southwest from the north. Several of these storms pushed through the western U.S. tightening the pressure gradient across Arizona leading to several days of gusty, hot and dry southwest winds across the region. One passing storm system did manage to pull up some soupy tropical air that pushed north through Mexico with the help of hurricane Cristina. The only substantial precipitation recorded by Rainloggers across the state during June occurred on the 13th across the far southeast corner of the state. Several lucky observers in Cochise County recorded precipitation amounts of 0.1 to 0.3 inches on the 13th as isolated thunderstorms moved across the area. Overall, the month was unusually hot and dry conditions with no improvements in short-term drought conditions observed across the region. 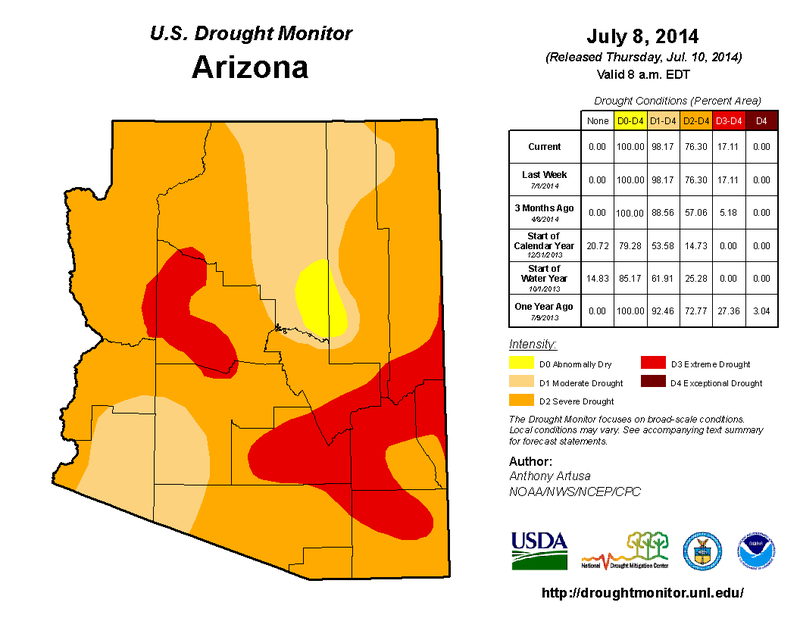 The Tucson National Weather Service Office reported that June 2014 was the 3rd hottest on record and the U.S. Drought Monitor still has all of Arizona under moderate to extreme drought. The monsoon is in full swing which should help alleviate some short-term drought impacts and reduce fire danger across the region. An El Nino event is still trying to get its act together across the Pacific Ocean which may also spell above-average precipitation for the Southwest later this fall and winter.